Introduction: Asthma is a heterogeneous disease, usually characterized by chronic airway inflammation. The World Health Organization considers asthma as the most important chronic respiratory disease of the childhood. Aim: The aim of this study was to observe the changes in oral health and salivary pH, of asthmatic children aged between 7 and 14 years, treated with different combinations of inhaled medication. Materials and Methods: A total of 120 children aged between 7 and 14 years were divided into two groups of which 60 were asthmatic children and the rest 60 were nonasthmatic which were served as control group. Dental caries was assessed using decayed missing filled tooth (DMFT) index for permanent teeth and decayed extracted filled tooth (DEFT) index for primary teeth. Oral hygiene status was determined by simplified oral hygiene index (OHI-S) and modified (OHI-S) index for primary teeth. The resting salivary pH was estimated using pH strips and comparison was made between both groups. Results: The mean value of dental caries (DMFT and DEFT) was found to be significantly higher among study group compared to control group (P < 0.05), while for salivary pH, it was significantly lower among the study group compared to control (P < 0.05), whereas oral hygiene status was statistically not significant in relation to anti-asthmatic medications. Conclusions: Children with asthma have higher caries prevalence, lower salivary pH compared to the control group, which can be due to use of anti-asthmatics medications. The prevalence of asthma has been increasing since the 1980s. Asthma and tooth decay are the two major causes of school absenteeism. It was suggested as a risk factor for increased susceptibility to caries first in the 1970s. The medication given for bronchial asthma has a detrimental effect in the oral cavity such as reduction of salivary secretion and change in salivary composition and pH. Some studies have shown that the children who receive β2-agonists have a higher prevalence of dental caries and it increases with the severity of bronchial asthma when compared with healthy controls. Relatively, there are fewer studies on the effect of different type of β2-agonists on salivary pH and dental caries. Thus, this study was performed with an objective to evaluate the effect of long-term use of different type of inhalational medications on oral health of asthmatic children between 7 and 14 years of age. The study group consisted of 60 asthmatic children between 7 and 14 years recorded according to their last birthday. According to their medical records, they were diagnosed to have asthma and were under treatment for the same for more than 1 year. The same numbers of age-matched healthy controls (60) were also included from the same socioeconomic and educational level. Group 3: Included 20 asthmatic children, who were using combination drugs (corticosteroid and long-acting (Salmeterol) β2-agonist inhalers. A control group consisted of 60 healthy looking participants matching the study group with age and gender were examined, they accompanied patients in the same hospital to be from the same socioeconomic and educational level. Clinical examination was carried out for each patient of all the groups under a standardized condition. General information was recorded before the examination which included name, age, gender, socioeconomic state, type, and duration of asthmatics medications. Patients taking their asthma medication irregularly or discontinuing it without the physician's order were excluded from the study. The investigation was carried out in morning hour, between 8 AM and 11 AM. Dental caries was assessed using decayed missing filled tooth (DMFT) and decayed extracted filled tooth (DEFT) indices, while oral hygiene status was assessed by simplified oral hygiene index (OHI-S) and modified (OHI-S) index for primary teeth. The resting salivary pH was assessed using plastic pH strips (Micro Essential Laboratory's pHydrion pH strips for saliva testing manufactured in the USA). For each patient, examination was made by putting the plastic pH strip in the floor of the mouth for 5 s and then matching the color with the color chart. Data processing and analysis were carried out using SPSS 20 (IBM, Armonk, NY, USA); this includes Paired t-test, Chi-square test, Student's t-test, and One-way ANOVA. The confidence limit was accepted at 95% (P < 0.05) and P < 0.01 was regarded as highly significant. The first parameter of the study was dental caries. The mean value of dental caries DMFT/DEFT was found to be statistically higher among study group (asthmatic children) compared to control group (healthy children) (P < 0.05) [Figure 1] and [Figure 2]. In the study group, one-way ANOVA analysis of DMFT showed that there was significantly higher incidence of dental caries among children who were using combination drug (Salmeterol + corticosteroid) than those using either Salbutamol or ICSs only (P = 0.019) [Figure 3]. The second parameter of the study was salivary pH. 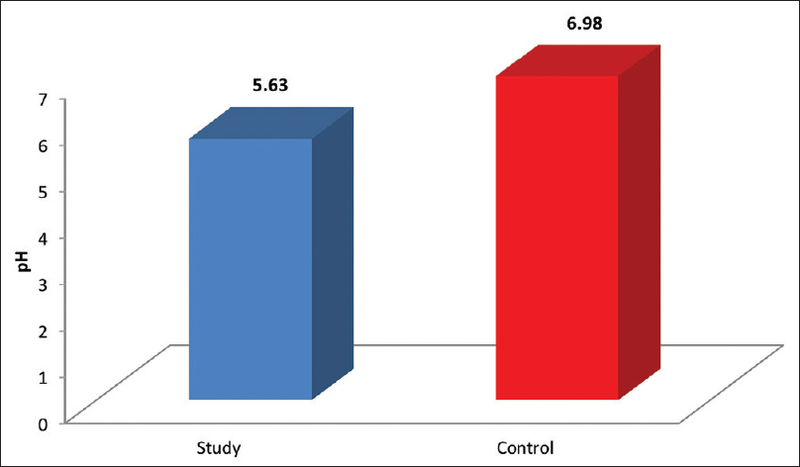 The mean value of salivary pH was found to be significantly lower among study group compared to the control group (P < 0.05) [Figure 4]. Furthermore, the relation between pH and anti-asthmatic medications demonstrated a significant decrease (P < 0.05) in salivary pH in children who were using combination drugs than those using Salbutamol and ICSs independently [Figure 5]. 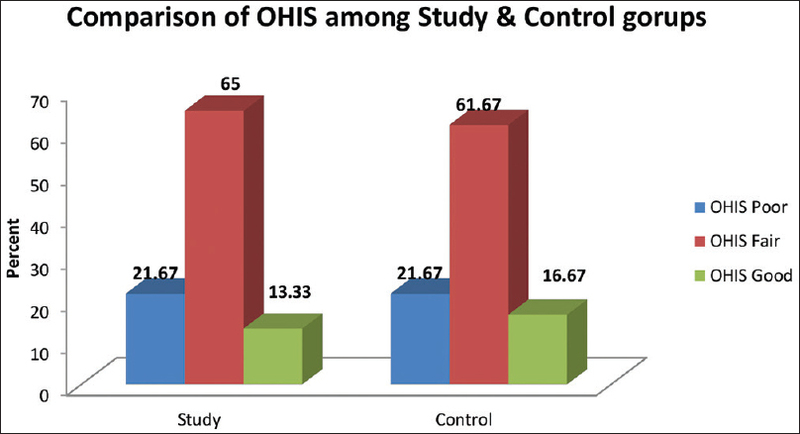 The third parameter of the study was OHI and the statistical analysis revealed that there was no significant difference in OHI-S values between the two examined groups, that is, asthmatic and control groups (Chi-square test P = 0.872) [Figure 6]. Asthma and the use of asthmatic medication have long been suggested to potentially increase the risk of oral and dental health problem. Asthma is treated using many types of drugs. This study contributes useful information to further substantiate the relationship between asthmatic medication and dental caries. In this study, the asthmatic children had a higher mean DMFT/DEFT score (mean 3.05/2.28) when compared to controls (1.05/1.12) and the difference was found to be statistically significant (P < 0.005). Similar study findings were seen by Khalilzadeh et al. which showed higher DMFT (3.3 + 2.8) in asthmatic children as compared to the healthy controls. The possible cause of an increase in caries prevalence among asthmatic patients has been related to the use of β2-agonist in the treatment of asthma. A decrease of the salivary and plaque pH has been detected in asthmatic children after the use of asthmatic inhalers. Reduced salivary flow rate in asthmatic children is accompanied by a concomitant increase in cariogenic microorganisms, lactobacilli and Streptococcus mutans in the oral cavity, which are contributing factors for higher caries rate in diminution of salivation and lack of masticatory movements during night, further increase the cariogenic potential in asthmatic children as the medication are generally taken at night before retiring to bed. Stensson et al., Shashikiran et al., and McDerra et al. did not demonstrate a positive association between asthma and dental caries. According to the type of medications, the result of one-way ANOVA test for DMFT in the present study showed that there was a significant difference among children who were using combination drugs (corticosteroid + long β2-agonist [salmeterol] inhaler) than those who were using Salbutamol or ICSs (Corticosteroid + Salbutamol). In our study, the possible cause for high mean dental caries in children using Salmeterol inhaler can be explained by the property of the drug, being a long-acting, highly selective β2-adrenoceptor agonist with a duration of at least 12 h. Furthermore, it has a long-carbon chain attached, which makes it bind almost irreversibly for many hours to the exo-site of the β2,-adrenoceptor. It also resulted in decreased protein and calcium concentrations and an increased ratio of sialic acid: total protein in saliva which decreases the saliva secretion from the salivary gland. Thus, it can impair the secretion of salivary proteins and calcium which might contribute to increase in caries. One of the main reasons for an increased prevalence of caries in asthmatic children could be the reduced salivary pH which was found in our study. It has been suggested that prolonged use of β2-agonists is associated with diminished salivary production and secretion, reduced pH of saliva and plaque, and thus an increased frequency of caries. Since salivary buffering capacity has been lost, an acidic environment is encouraged and persists longer. This in turn encourages growth of aciduric bacteria such as lactobacilli and S. mutants which grow and continue to metabolize carbohydrate in the low pH environment. Another factor related to an increase in caries risk in asthmatics is the decrease in pH of saliva. Plaque in asthmatics might be caused by the prolonged usage of the drug and not the disease. It has been shown that a large proportion of inhaled drug might be retained in the oropharynx. The amount of retained drug could range from 60% (dry powder inhaler with extension tube) to 80% (metered dose inhaler). In addition, some dry powder inhalers contain sugar so that the patient can better tolerate the taste of the drug; like in our study, salmeterol contain 12.5 mg and salbutamol contain 7.5 mg lactose as a carrier for the active substance of the medicine. Frequent oral inhalation of sugar combined with a decrease in salivary flow rate and a decrease in pH of saliva might contribute to increase in caries. It also appears to be a reasonable assumption that precisely because these children are under medical supervision and are considered as “problems.” Asthmatics will be encouraged to intensify measures of dental self-care. Nowadays, in general, parents' care of their children's oral hygiene has improved. This study shows that oral health status of asthmatic children under medication is comparatively poor with high dental caries experience, low salivary pH, and compromised oral hygiene status. Asthmatic patients are, hence, recommended to adopt more precautionary oral hygiene practices and keep their caries activity and oral health under constant check. Hence, it is important to develop collaboration between dental and medical caregivers in relation to children with asthma. A multidisciplinary approach for the treatment of the affected children is the key to improved health-care delivery and better quality of life among these patients. Mazzoleni S, Stellini E, Cavaleri E, Angelova Volponi A, Ferro R, Fochesato Colombani S, et al. Dental caries in children with asthma undergoing treatment with short-acting beta2-agonists. Eur J Paediatr Dent 2008;9:132-8. AL-Wattar TZ. Effects of anti asthmatic medication on oral heath. Int J Enhanced Res Sci Technol Eng 2015;4:72-9. Shashikiran ND, Reddy VV, Raju PK. Effect of antiasthmatic medication on dental disease: Dental caries and periodontal disease. J Indian Soc Pedod Prev Dent 2007;25:65-8. Chellaih P, Sivadas G, Chintu S, Vaishnavi Vedam VK, Arunachalam R, Sarsu M. Effect of anti-asthmatic drugs on dental health: A comparative study. J Pharm Bioallied Sci 2016;8:S77-80. Khalilzadeh S, Salamzadeh J, Salem F, Salem K, Vala MH. Dental caries-associated microorganisms in asthmatic children. Tanaffos 2007;6:42-6. Kumar B, Avinash A, Kashyap N, Sharma M, Munot H, Sagar MK. Comparative evaluation of dental caries in asthmatic and asthma-free children: A cross-sectional Study. Int J Prev Clin Dent Res 2017;4:85-90. Stensson M, Wendt LK, Koch G, Oldaeus G, Birkhed D. Oral health in preschool children with asthma. Int J Paediatr Dent 2008;18:243-50. McDerra EJ, Pollard MA, Curzon ME. The dental status of asthmatic british school children. Pediatr Dent 1998;20:281-7. Ryberg M, Johansson I. The effects of long-term treatment with salmeterol and salbutamol on the flow rate and composition of whole saliva in the rat. Arch Oral Biol 1995;40:187-91. Eloot AK, Vanobbergen JN, De Baets F, Martens LC. Oral health and habits in children with asthma related to severity and duration of condition. Eur J Paediatr Dent 2004;5:210-5.